Gillian Locke has been beaten, battered, and bruised, but her ex-boyfriend still hasn’t managed to break her. When she leaves Kyle for the last time, she knows the only way she’ll ever be back in his grasp is over her dead body. On the run, her car disastrously breaks down in at the top of a mountain in the middle of nowhere. Stuck in a terrible snowstorm, Gillian figures it’s better to die at the hands of nature, than at the hands of Kyle, her tormentor. 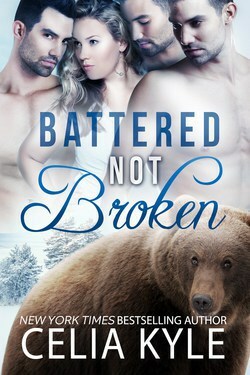 Fighting the freezing cold, she stares death in the eye and presses on, until she happens upon a cabin in the woods, and is offered shelter by three gorgeous men who can’t seem to get enough of her. The Bearclaw brothers are descendants of the ancient Anikota tribe of Indians. Their beast spirit and blessing from the Maker allows them the ability to sense the one who will complete their soul. Being triplets, they always expected their mate to be a woman they’d all share. With the Maker’s blessing, they hope to ease past Gillian’s defenses…before her past threatens to end their future. Sleet whipped through the trees, stinging her face and burrowing through her clothes to chill her skin. Gillian tightened her hold on the jacket as the wind threatened to yank it from her shoulders. Her fingers tunneled into her skimpy pockets, searching for warmth that wasn’t there. Feet crunching and sinking into the dangerous snow brought her closer and closer to her goal. Warmth was only footsteps away…many, many footsteps. From the road, where she’d left her broken-down car, the smoke rising in the trees hadn’t seemed too far off. Now, hours later, it seemed like she’d been walking for an eternity. Gillian was tempted to check her watch again, to see how long she’d been walking down the slushy, rutted road, but couldn’t force her hands to leave the haven in her pockets. One foot in front of the other, she kept trekking, stumbling over unseen rocks and tripping in hidden holes. Exhaustion began to overtake her. Each breath puffed from her mouth, turning the air bright white before she sucked back in frigid air, which seemed to freeze Gillian from the inside out. But she couldn’t stop, could never stop. The worn road she followed twisted and turned through the trees. Every time she came to a bend, she made a wish that her destination would be around the next corner. But it wasn’t, so she kept pushing, begging her feet to move. Mind over matter, girl, just a few more steps. She’d lost the feeling in her feet hours before. The wind picked up again and pummeled the sleet into her skin like a thousand tiny knives. Hunching her shoulders to shield her face, she continued. Can’t stop. He’ll catch me. She couldn’t afford to get caught. She wouldn’t go back, not ever again. The last time…the last time she’d nearly died. Not again, not ever again. Gillian licked her lips, tasting blood as her tongue wet her cracked skin. Hours. It had only taken hours for the cold and wind to do its damage. Tears pricked her eyes and more than once she thought about returning to her car to wait for someone to pass by, to help her. But on these deserted mountain roads, hardly anyone ever drove by, especially with a blizzard churning and threatening the area. Now she would die in the cold, alone. At least it would happen her way and not at another’s hands. More time passed and each breath became more labored–the only sound the harsh inhalation and exhalation as she tried to fill her lungs. The landscape was bare of animals, not even the squawk of a bird could be heard to distract her from the struggle to keep going. They were probably snuggled in their own homes for the winter. Shadows crossed the road now, the sun having dipped behind the trees for its own slumber. The smoke had looked so close when she started out; she should have known. Gillian wasn’t an outdoorsy woman–close to her, ended up being miles and miles away in reality. But still she continued. She’d walk until she collapsed or found warmth for the night; whichever came first. Head down, she lumbered on. It wasn’t until she ran into the gate that she realized she’d reached her destination. The end of the road had come and now she stood before what she’d been dreaming of all day. A cottage. No, a cabin. A large log cabin with wisps of smoke wafting from the chimney proved she hadn’t been walking toward a dream. With weathered logs forming the walls and a wood shingle roof, it looked like a solid structure, built to spite the elements. She tugged her hand free of her coat pocket and lifted the latch on the gate, calling out a greeting as she stepped through the wooden portal. Her voice was lost with the wind and pain sliced through her throat. The damaged tissues still hadn’t healed. Closing the gate behind her and dropping the latch in place to make sure it was locked, she stepped across the snow-covered lawn. Careful of any hidden dangers, she tested the ground with each step just as she’d done all day. She didn’t want to stumble and fall when so close to her goal. Sheer determination kept her on her feet now, denying the toll the weather had taken on her body. One puffing breath and straining step at a time she climbed the steps, shuffling across the worn plank porch to the front door. She’d burrowed her hand back in the meager warmth in her pocket, but she reluctantly withdrew it again. Raising the knocker, she let it fall against the tarnished brass plate on the door, its booming echo mixing with the wind as it whipped around the cabin. All that, for nothing. Gillian waited, but no sound from within the cabin could be heard. She forced her muscles into action again, raising and releasing the knocker to fall against the brass plate for a second time. The sound echoed, louder this time, yet still there was no answer. Tears burned her eyes, and she didn’t hold them back. A fire burned in their hearth and they were either not home or choosing to ignore the bundled, bruised, and beaten woman at their door. Gillian rest her head against the carved wooden door and she let her tears flow, the warm liquid stinging her near frozen skin as it slid across her cheeks. In a last effort for survival and with the remaining strength she possessed, Gillian wrapped her hand around the doorknob and twisted, stumbling when the door pushed open with her weight. She caught herself on the door then stepped into the cabin. Warmth like she never thought to feel again enveloped her, seeped through her jeans and poor excuse for a jacket. As the heat surrounded her body, pinpricks of pain replaced the numbness she had grown accustomed to. Her waking skin burned as blood returned to her extremities.